Well here is a recap of all of the recipes for August’s Cookbook Of the Month. 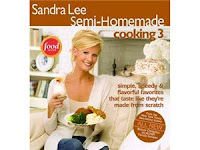 Overall I liked Sandra Lee’s Semi-Homemade Cooking 3. All of the recipes I tried were easy to make, with ingredients that are easily found at any grocery store. Also the book tells you specific name brand ingredients; which of course you can use the brand you like but I thought it was very helpful to look for a specific brand label when I shopped. I also like the fact that the book was divided into several categories (Italian, Mexican, Asian, Soul food, etc) and at the beginning of the book there was a section that explained different foods that were common ingredients in the different styles of cooking. Another plus for this book was the abundance of pictures (gotta love them). I feel with Sandra’s books, cooking shows, and recipes in general; that they are great for beginners and starting points for the more advance cooks/bakers. There are several more recipes I would like to go back and try but I feel like I am going to build upon the already given recipe and make it more of my own. 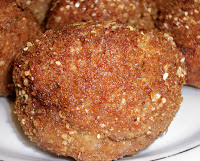 These Zesty Fried Meatballs were awesome. They were easy to make and one batch was more than enough to feed several people. I really can’t say more but to definitely make them. Hands down, no questions asked (I will be making again). (The original recipe came with a red pepper sauce, however my blender is broken so I couldn’t make it BUT I am sure it would have been a perfect accompaniment). The next recipe I made was Danielle’s Lemon Ricotta Pancakes. These were not to hot in my book. They seemed more crape like than pancake like and the lemon flavor was WAY too strong (I mean come on do we need lemon juice and lemon extract). 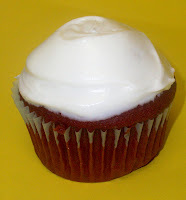 I then ventured into baking with this book and made Red Velvet (Cup)Cakes. The original recipe was for like a 5 layer cake but I cut it in half and made cupcakes. It made plenty and I still have left over frosting in my fridge (um I am ashamed to admit that, but we are all friends right? Ok, Ok I am going to go through it out right now). Anyways these cupcakes were good and totally all got eaten in a 5 second time frame but they were not THE most amazing things ever (click on the link and read all about my qualms there). And finally because there are 5 Mondays in August this year, or maybe I needed my in take of mercury (I mean omega-3), or maybe I was tired of pork and chicken and beef; I decided to splurge and make some Orange-Ginger Tuna. I am happy I did, it was very yummy and ‘fancy-schmancy’ (not quite sure how to spell that one)! So there you have it- 3 days into September and I am finally done with all of August’s recipes. And I would say overall things went great or were rather tasty depending on how you look at it!